Do you believe the 2004 National Exit Poll (13,660 respondents)? If you do, then you must also believe in miracles. The NEP was adjusted to match the recorded vote (Bush 50.7-48.3%). It indicated that there were 6 million more returning Bush 2000 voters than were alive in 2004 – an impossible 110% turnout. View the 2004 unadjusted state and national exit polls. The pollsters had to create 6 million Bush phantoms in order to force the unadjusted NEP to match the recorded vote. It’s basic Logic 101: If an impossible number of returning Bush 2000 voters is required for the 2004 National Exit Poll to match the recorded vote, then the 2004 recorded vote must also be impossible. Ergo, the FINAL exit poll and the official vote count must both be fraudulent. 1) National poll (13,660 respondents). Kerry had 51.7%. 2) State exit polls (76,192 respondents). Kerry had 51.1%. Let’s calculate the returning Gore and Bush percentage mix of 2004 voters, assuming 1.25% annual mortality and 97% Gore/Bush turnout of living voters. 1) 2000 Votes cast: Gore by 50.0-47.3%. He had 75% of 6 million uncounted votes. Returning Gore/Bush share of 2004 electorate: 41.0/38.2%. 2) 2000 Unadjusted State Exit Poll aggregate: Gore by 50.8-45.5%. Returning Gore/Bush share of 2004 vote: 41.4/37.0%. 3) 2000 Unadjusted National Exit Poll: Gore by 48.5-46.3%. Returning Gore/Bush share of 2004 electorate: 39.4/37.6%. 4) 2004 National Exit Poll (adjusted to matched the recorded vote). Returning Gore/Bush share of 2004 electorate:37/43% (impossible 110% living Bush 2000 voter turnout). Given the 2000 recorded vote, unadjusted NEP (13660 respondents) vote shares and a 98% turnout of living Bush 2000 voters, Kerry needed just 73% of living Gore voters to TIE Bush. For Bush to win a 3.0 million recorded vote “mandate”, there had to be a 64% maximum turnout of Gore voters. If you believe that was the case, there is a great Chinese restaurant in lower Manhattan near a famous old bridge for sale. Assuming a plausible 98% turnout of Gore and Bush voters, Kerry had a 53.6% True Vote and won by more than 10 million votes. Consider the following myths and anomalies about the 2004 election. 1- Myth: The media exhaustively analyzed state and national pre-election /exit poll data and documented evidence of vote suppression and miscounts. Fact: raw exit poll precinct data has never been made public. And the pundits have failed to explain the impossible anomalies in the final national and state exit polls. 2- Myth: There are many explanations as to why the exit polls were wrong. Fact: Kerry voters sought to be interviewed; Bush voters were reluctant; young interviewers sought out Kerry voters; returning Gore voters lied to the exit pollsters and said that they voted for Bush in 2000; exit polls are not random samples; exit polls in the U.S. are not designed to catch election fraud; early exit polls overstated the Kerry vote; women voted early; Republicans voted late; Gore voters defected to Bush at twice the rate that Bush voters defected to Kerry, etc. Fact: none are supported by the evidence. In fact, they are refuted by the exit pollsters own data and timeline. 3- Myth: The votes were fairly counted. Fact: There is no way to prove that. Voting machines are vulnerable and the code is proprietary; there is no chain of evidence or hand-recounts of paper ballots. The 2004 Vote Census indicates that 125.7 million votes were cast and just 122.3m recorded. Investigative reporter Greg Palast provided government data which confirmed the Census: at least 3 million ballots were never counted. 4- Myth: Democrats failed to attract first-time voters. Fact: According to the National Exit Poll (NEP), the Democratic candidates won first-time voters by solid margins in every election since 1992. In 2008 Obama won new voters by 71-27%. 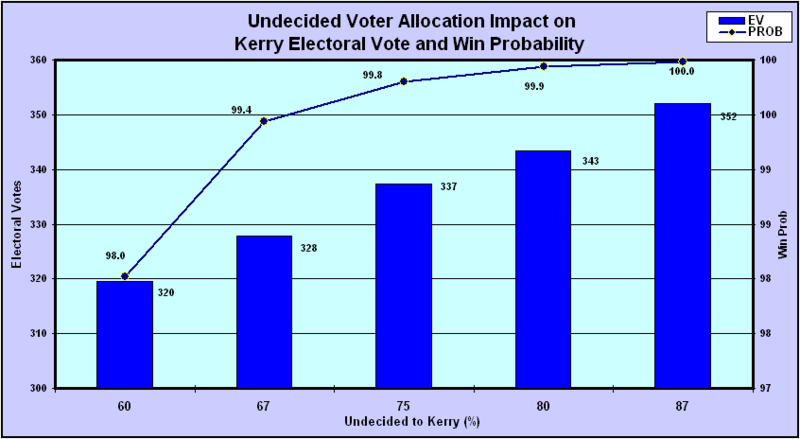 The 2004 NEP timeline indicated that Kerry had 62% of new voters at 4pm, 59% at 9pm and 57% at 1222am. But the Final NEP was forced to match the recorded vote. It indicated that Kerry had just 54% of new voters, a massive 8% decline from the earlier share. 5- Myth: Bush’s 48% Election Day approval rating was not a major factor. Fact: Since 1976 all presidential incumbents with less than 50% approval lost re-election (Ford, Carter, Bush 1). Incumbents above 50% won (Eisenhower, Johnson, Nixon, Reagan, Clinton). 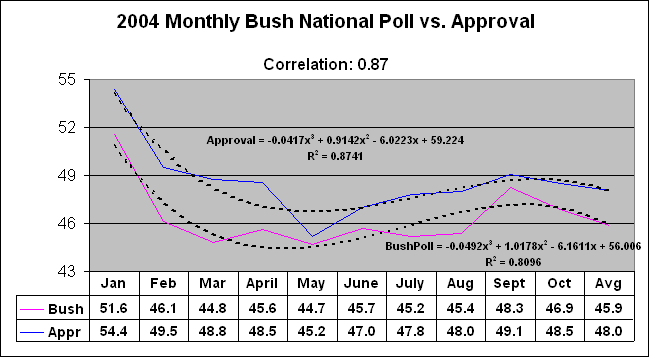 There was a near-perfect 0.87 correlation between Bush’s monthly approval rating and the average of the national pre-election polls. The correlation was confirmed when Kerry won the National Exit Poll by 51-48%. Fact: That is an Urban Legend. It is counter-intuitive: Bush lost 3% in highly Republican small towns and rural areas. He stole millions of votes in urban and suburban locations. 7- Myth: Late voters came out for Bush. 8- Myth: The final pre-election polls did not match the exit polls. Fact: After undecided voters were allocated (3-1 for Kerry), the weighted pre-election state (Kerry 47.9-Bush 46.9% to 50.9-47.9) and national polls (Kerry 47.2-46.9% to 50.2-47.9) closely matched the aggregate weighted unadjusted state (51.7-47.0%) and national exit polls(51.1-47.9%). 9- Myth: Bogus assumptions in the Election Model enabled the forecast that Kerry would win 337 EV. Fact: The only (conservative) assumption was that Kerry would capture at least 75% of the undecided vote. 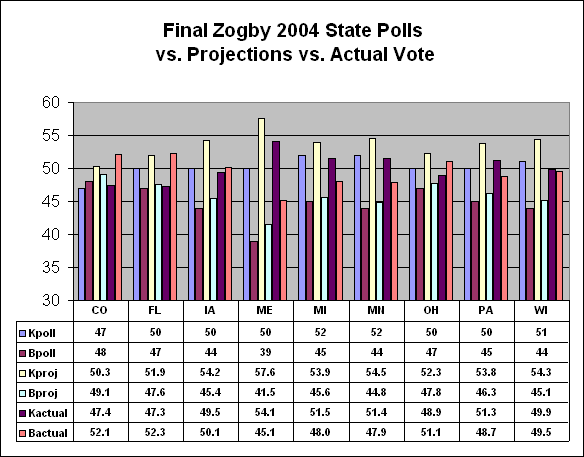 Popular and electoral vote projections were confirmed by the 2004 Election Simulation and True Vote Model. 10- Myth: There is no evidence that undecided voters break for the challenger. Fact: Historical evidence shows that undecided voters break for the challenger at least 80% of the time – especially when the incumbent is unpopular. Bush had a 48% average approval rating. World-class pollsters Harris and Zogby reported that late polling indicated Kerry would win 60-80% of the undecided vote. Gallup allocated 88% of undecided voters to Kerry. 11- Myth: Bush was leading in the final pre-election polls. Fact: Kerry led Bush by close to 1% in the weighted state polls They were tied at 47% based on the national 18-poll average. After allocating the undecided 5%, Kerry was a 51-48% winner. 12- Myth: Non-response exit poll bias (reluctant Bush responder) was the reason 43 states red-shifted from the exit polls to the recorded vote to Bush. Fact: Response rates were lowest in Kerry urban strongholds and highest in Bush strongholds. The rBr hypothesis was proven false by US Count Votes. Fact: Oregon is the only state which votes by mail or hand-delivered paper ballots AND mandates hand counts of randomly selected counties – a powerful election fraud deterrent. Kerry did worse than Gore in the other battleground states because none of them had an equivalent fraud deterrent. DRE touchscreen computers that were used to calculate 30% of the votes are unverifiable. Optical scanned paper ballots were not hand-counted. 14- Myth: exit polls did not indicate that electronic voting machines are fraudulent. Fact: All voting methods had high discrepancies – except for paper ballots which had just a 2% average discrepancy. Lever machine precincts had the highest (11%) discrepancies. Unverifiable touch screen (DRE) and optical scan precincts each had 7%. There were 88 reported touchscreen vote switching incidents – 86 switched votes from Kerry to Bush (a zero probability). 15- Myth: “The exit polls behaved badly”. Fact: Final state and national exit polls are ALWAYS FORCED TO MATCH the recorded vote. It’s standard operating procedure. But the media pundits assume a fraud-free election. Millions of uncounted votes prove that elections have been anything but fraud-free. And the 6 million phantom Bush voters required by the Final 2004 National Exit Poll to match the recorded vote proves that it cannot be correct. 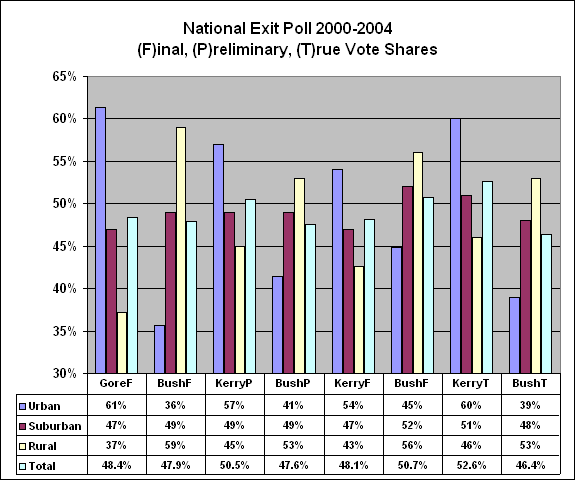 16- Myth: Kerry led in the early exit polls, but Bush passed him in the final. 17- Myth: The exit poll margin of error was too low. Fact: Even assuming a 60% “cluster effect”, the probabilities were near zero. The exit poll discrepancies exceeded the MoE in 29 states for Bush and just one for Kerry – a zero probability. Assuming a 30% cluster effect, the MoE was exceeded in 24 states for Bush. 18- Myth: There is nothing suspicious about the fact that all 21 Eastern Time Zone states red-shifted from the exit poll in favor of Bush. Fact: The probability of the one-sided red shift is equivalent to coin-flipping 21 consecutive heads: 1 in 2 million. But 14 exit polls deviated beyond the margin of error – a ZERO probability. 19- Myth: Exit polls are not true random samples. Fact: This is contradicted by the Final National Exit Poll. The Final indicated that returning Bush 2000 voters comprised 43% of the 2004 electorate compared to just 37% for Gore voters (i.e. there were 7 million more returning Bush than Gore voters). But Gore won the unadjusted exit poll by 50-45% (3-6 million votes). The rBr canard was also contradicted by a linear regression analysis. Non-response rates were highest in Kerry strongholds, indicating that most non-responders were in fact Kerry voters. 21- Myth: Ohio, Florida and National exit polls show that Bush won. Fact: FINAL State and National exit polls are ALWAYS adjusted (forced) to match the recorded vote even when the votes are miscounted – as they were in 2004. Unadjusted state and national exit polls showed Kerry winning by 54-45% in Ohio, and 51-48% in Florida. He won by 52-47% in the unadjusted National Exit Poll. 22- Myth: The Final NEP 43/37 Bush/Gore returning voter mix is possible. After all, it’s just a poll. Fact: The 43/37 mix was not a polling result. It was contrived to force a match to the recorded vote. This is the incontrovertible proof: Kerry had 7074 (51.7%) of the UNADJUSTED 13660 NEP respondents; Bush had 6414 (47.0%). Of the 13660, 3182 were asked who they voted for in 2000: 1257 (39.5%) said Bush, 1221 (38.4%) said Gore. When the 39.5/38.4 mix is applied to the 12:22am NEP vote shares, Kerry has 51.7%, EXACTLY MATCHING THE UNADJUSTED NEP. This exposes the Final NEP 43/37 Bush/Gore returning voter mix. It is additional proof that mix was a FORCED CONTRIVANCE to MATCH the BOGUS RECORDED VOTE and NOT an actual sample. Fact: The mix could not have from changed from 41/39 at 12:22am to 43/37 with just 613 additional respondents. Bush 2000 voters could not have comprised 43% (52.6 million) of the 122.3 million votes recorded in 2004 since he only had 50.5 million votes in 2000. Approximately 2.5 million Bush 2000 voters died prior to the 2004 election. Therefore, there were at most 48.0 million returning Bush voters in 2004 – assuming an impossible 100% turnout. If 98% turned out, there were 47.0 million returning Bush voters. That means there had to be 5.6 million (52.6 less 47.0) phantom voters. Fact: In order to force a match to the recorded vote, the NEP vote shares had to be adjusted to implausible levels far beyond the margin of error. The scenario required a) Kerry’s share of new voters reduced from 57% to 52.9%, b) Bush’s share of Gore voters increased from 8% to 14.6% and c) Bush 2000 returning voter defection rate reduced from 10% to 7.2%. Fact: “Swing vs. Red-shift” is based on an invalid premise and twisted logic. It uses 2000 and 2004 recorded votes to prove there was no fraud in 2004. But the votes were obviously fraudulent (there were 6 million uncounted votes in 2000 and 4 million in 2004). There is a strong correlation between vote swing and red-shift when unadjusted state exit polls are used as proxies for the True Vote. Fact: The 43/37 argument is hereby put to eternal rest. This closes the book on “False Recall”. Of the total 13660 NEP respondents, 7064 (51.7%) voted for Kerry and 6414 (47.0%) for Bush. Only 3182 were asked who they voted for in 2000: 1257 (39.5%) said Bush, 1221 (38.4%) said Gore. Using the 39.5/38.4% mix and 12:22am NEP vote shares, Kerry wins by 51.8-46.8%, exactly matching the unadjusted NEP, putting the lie to the published Final NEP (Bush 50.7-48.3%). The Final was derived by forcing a match based on a fictitious 43/37 returning Bush/Gore mix. The unadjusted 13660 sample had to be “adjusted” to have the Final NEP match the fraudulent recorded share. Bottom line: The rationale for the 43/37% returning voter mix is no longer debatable. It was clearly a forced result – not an actual sample. 26- Myth: An NES survey indicates that “a slow drifting fog” caused Gore voters to say they voted for Bush. Fact: NES used 2000 and 2004 (105.4m and 122.3m) recorded votes as a baseline for the survey, rather than True Votes cast (110.8m and 125.7m). There were nearly 6 million uncounted votes in 2000, of which approximately 4.5 million were for Gore. Counting these votes, Gore won the True Vote by 2-3 million – not the 540,000 recorded. And Kerry won 3 of 4 million uncounted votes. Using votes cast as the baseline shows that NES respondents did not misstate their 2000 vote. Fact: Only 3182 (23%) of 13660 of respondents were asked how they voted in 2000. All were asked who they voted for in 2004. Voters do not forget who they voted for in the previous election, much less how they just voted a few minutes earlier. False recall was obviously not a factor in the pre-election polls; they matched the exit polls after undecided voters were allocated. The unadjusted National Exit Poll data has been released, so we know that exactly 51.7% of the respondents voted for Kerry – and just 47.0% for Bush. 27- Myth: Returning Gore voters misrepresented their 2000 vote to the exit pollsters because they wanted to be associated with the winner: Bush. Fact: Bush had a 48% approval rating on Election Day. The majority of new voters were Democrats and Independents who gave Bush 10-20% approval. Gore was the popular vote winner in 2000 – by at least 3 million True Votes. So why would Gore voters want to be associated with Bush? It makes no sense. 28- Myth: Bush gained 12 million new voters in 2004. Fact: Simple arithmetic shows that Bush needed more than 16 million new voters. He had 50.5m recorded votes in 2000. Approximately 2.5m died and 1.0m did not return to vote in 2004. Therefore, 47 million Bush 2000 voters returned to vote in 2004. He needed 15 million (68%) of 22 million new voters to get his recorded 62 million. But according to the 12:22am National Exit Poll, he had just 9 million(41%) new voters – 7 million (27%) fewer than he needed. The probability that 68% of new voters voted for Bush is ZERO. 29- Myth: Bush won by a 3 million vote “mandate”. Fact: Gore won by 540,000 recorded votes officially so Kerry had a head-start. According to the 12:22am National Exit Poll, Kerry had 57% of new (DNV) voters (first-timers and others who did not vote in 2000). He won returning Nader voters by 64-17% and 10% of Bush voters. Just 8% of Gore voters defected to Bush. So how could Bush have won? He needed a massive net defection of Gore voters. And Gore won by 3-6 million votes – not the 540,000 recorded. That makes it impossible for Bush to have won. 30- Myth: Sensitivity analysis showing that Kerry won all plausible scenarios is not a mathematical proof. Fact: It is proof beyond a reasonable doubt when the WORST CASE (implausible) scenario indicates a Kerry win probability GREATER THAN 90% and the BASE CASE (plausible) scenario indicates a win probability GREATER THAN 99%. 31- Myth: Bush’s share of females (48%) increased by 4.2% over his 2000 share. Fact: That’s implausible since his share of males declined by 0.2%. It is totally counter-intuitive to believe that females would defect to Bush and males would defect to Kerry. In the 12:22am NEP, females voted 54-45% for Kerry. 32- Myth: Bush won Ohio. Fact: There is much documented evidence of uncounted and switched votes, besides massive voter disenfranchisement. Two election workers were convicted of rigging the recount. Fifty-six of 88 county voting records were destroyed. The final Zogby poll had Kerry leading by 50-47%. Kerry led the unadjusted Ohio exit poll by 54.1-45.9%. He led the adjusted 12:40am Composite by 52.1-47.9%. 33- Myth: Bush won Florida by 52-47%, a 368,000 vote margin. Fact: Democrats had a 41-37% registration advantage in Touch Screen (DRE) counties and a 42-39% advantage in Optical Scan (OS) counties. Kerry won DRE counties (3.9 million votes) by 51-47%. Bush won OS counties (3.4 million) by an implausible 57-42%. The final Zogby pre-election poll had Kerry leading by 50-47%. Kerry won the exit poll by 50.9-48.3%. In 2000, Gore had 70% of 180,000 uncounted votes; he won the state by at least 50,000 votes. Dan Rather’s expose on voting machines proved that the poor-quality paper used in the punch card machines was a major cause of ballot spoilage in heavily Democratic precincts. Fact: New York and California were rigged to inflate Bush’s popular vote margin and provided 2.0 million of his 3.0 million vote “mandate”. NY voted 60.5% for Gore, 35.4% for Bush and 4.1% for Nader. This is just one example of the impossible scenarios required to match the the 2004 NY vote: a) 100% of returning Nader voters had to break for Bush (he had 17% nationally), b) Bush needed 50% of new voters (he had 41% nationally), c) Bush needed 11% of returning Gore voters (he had 8% nationally). The clincher: Kerry’s NY share was 10% higher than his national share. How could Bush have done so much better in heavily Democratic NY with returning Gore, Nader and new voters than he did nationally? It is extremely counter-intuitive and makes no sense. Pre-election likely voter (LV) polls did not factor in the heavy turnout of new Kerry voters. The final pre-election NY LV poll had a 4% margin of error (MoE). There was a 95% probability that Kerry would be in the 54.5-62.5% range – and that is conservative because it is based on an LV poll. The NY exit poll had a 3.2% MoE. Therefore, there was a 95% probability that Kerry’s vote was between 60.9-67.3% and was within the MoE of BOTH the LV pre-election poll (which low-balled Kerry turnout) and the unadjusted exit poll. 35- Myth: Unlike touchscreens and optical scanners, lever voting machines cannot be programmed to switch votes. Fact: The NY exit poll discrepancy was 12% – far beyond the 3.2% margin of error. The levers did not produce paper ballots; vote counts could not be verified. Defective levers were placed in urban precincts; many voters left the precincts without voting. Lever advocates refuse to consider this fact: Votes CAST on levers were COUNTED on unverifiable central tabulators. 36- Myth: Polling data was cherry-picked and biased for Kerry. Fact: The following models used exit poll data for 1250 precincts provided by Edison-Mitofsky and included partisan response rates and corresponding average within precinct discrepancies (WPE). The models produced equivalent results. They confirmed the USCV simulation which debunked the reluctant Bush responder (rBr) hypothesis. a) 1250 precinct response: Kerry won the 2-party vote:52.1-47.9%. b) Location-size response: Kerry by 52.1-47.9%. c) State exit poll response: Kerry by 52.3-47.7%.